The Result of Fast Driving. Submitted by ken on May 3, 2007 - 11:17am. Editor: Speeding drivers is not a modern plague. This report from New Mexico editorializes about the need to control fast horse riding. A very serious accident happened to Mrs. Romero, wife of Manuel Romero on Wednesday afternoon, on the Mesilla road near the public school building. Mrs. Romero was riding out of town in Jesus Flores' wagon, Flores himself being the driver. He was driving very rapidly and when he turned the corner near the school building the wagon tipped to one side throwing the lady out. She alighted on the back of her head sustaining injuries thought to be fatal. When the physician was called in she complained of numbness in her limbs and feet, which would indicate that the spinal column has been injured. She was otherwise seriously bruised. Submitted by ken on May 2, 2007 - 9:18pm. 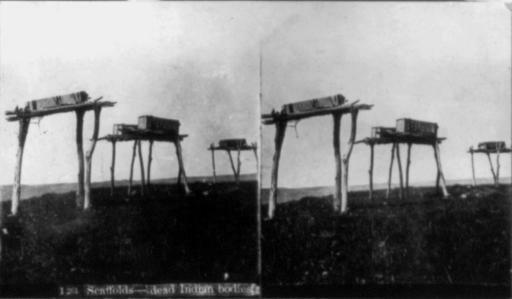 A stereograph card showing scaffolds bearing dead Indian bodies in Black Hills, South Dakota. c1907. View full image. Submitted by ken on May 2, 2007 - 11:17am. ACCOUNTS GIVEN BY THE GOVERNMENT OFFICERS -- SHOCKING BARBARITY OF THE SIOUX. Submitted by ken on May 1, 2007 - 7:04pm. 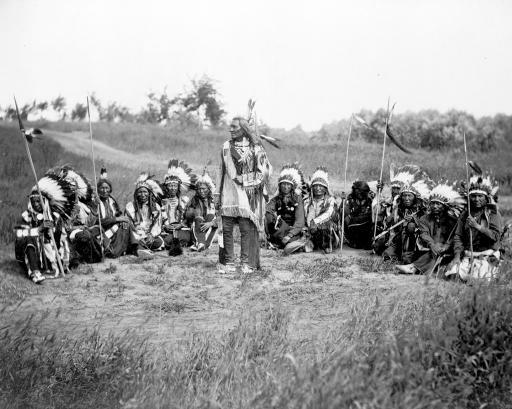 Chief Little Wound, wearing feather headdresses, in council with other Indians in Dakota Territory, c1899. View full image.